NOTE: All products featured in the sales section come highly recommended by Crystal Audio Video Design based on past experience. However, Crystal Audio Video Design can also source out any other specific brands you may be interested in purchasing. Free delivery is included with the purchase of audio video equipment. 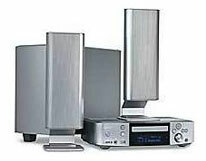 Crystal Audio Video Desin reserves the right to change prices and products offered on this website. Specifications, availability, prices and terms of offer are subject to change without notice. All prices are quoted in Canadian dollars (CAN$) unless otherwise indicated. The Acoustimass® six-speaker system puts high-performance sound for music and movies well within reach. Patented Bose® technology brings life-like sound to your stereo or 5.1-channel surround sound components. The Acoustimass six-speaker system is so small it blends effortlessly with your décor, making it an excellent choice for smaller rooms. The five satellites are true two-way speakers with advanced titanium-laminate-dome tweeters and dual drivers for more sound power and realism. uses a heat sink on the Neodymium magnet for superior heat dissipation, power handling and reliability. YSP Digital Sound Projectors take advantage of your walls to create true multi-channel surround sound. Through its exclusive use of sound beams, this compact system can be used in rooms of various size and shape to create five beam, stereo, three beam, three beam plus stereo, and targeted sound. Ideal for wall mounting. Highly recommended. The Polk Audio SurroundBar™ is designed to complete your High Definition TV experience. It’s the perfect match for flat-panel and shallow screen TVs. And it works with any surround sound receiver in any room to bring you the thrills of five-channel surround sound from a single speaker. Ideal for wall mounting. Highly recommended. The thrill of a home theater experience. The simplicity of fewer speakers and wires. This union of ideals is realized with the 3·2·1™ GSX DVD system. Two compact Gemstone speaker arrays flank your television, but produce realistic effects you might expect from rear speakers. A hideaway Acoustimass module delivers emphatic low notes, while keeping a low profile in a corner, or even out of sight. The S-301 is one of the most innovative and stylish home theater systems that merges the latest technology for superior sound, outstanding picture quality, simple and convenient connectivity and operation, and the utmost sophistication to integrate into any interior design. Providing a new and exciting way to enjoy the most diverse variety of home entertainment, including direct connectivity to your portable players – such as iPod or Rio MP3 players. 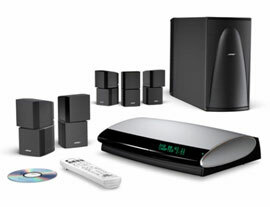 Experience the thrill of Home Theatre sound and DVD quality video in a system that won’t ruin your style. 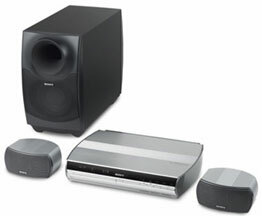 The amazing DAVX1 DVD Dream System delivers multi-dimensional home theatre sound with only two speakers and a subwoofer. The High-Definition Multimedia Interface (HDMI) upconverts regular DVD signals to 1080i to create a High Definition picture for spectacular digital video. 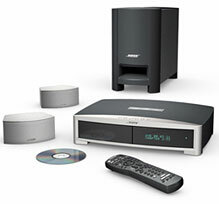 The Bose® Lifestyle® 38 DVD system is designed to listen, learn and adapt to your entertainment preferences, all while delivering Bose® quality sound. Our ADAPTiQ® audio calibration system analyzes and adjusts your Lifestyle® system to account for unique room acoustics. The innovative uMusic™ system stores and organizes up to 200 hours of music, and you can hear that music in up to 14 additional rooms throughout your home with Bose® link. The HS 100 is a true feat of system engineering, seamlessly blending the flexibility of an all-in-one receiver/progressive-scan DVD-Audio/Video player with our HKTS 7 speaker system so that home theater power is now available where it could never fit before. 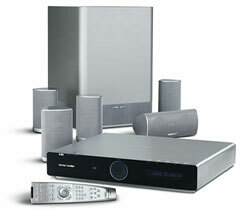 The audio and video features and performance that you expect from Harman Kardon® are all in this great product. Tune up your room; no tools required. Thanks to EzSet/EQ™, the AVR 340 not only establishes all system speaker parameters, it measures how the speakers "sound" in your room and equalizes their output to compensate for any room-based acoustic situation. Add a wide range of convenience features such as video cross conversion, component output for simplified connectivity, A-BUS/READY® multi-room capability, and compatibility with The Bridge™, and you’ll be enjoying movies and music quicker than ever. Experience the power of high-definition with the STR-DG800 7.1ch XM Ready HDMI Home Theatre Receiver. Its exceptional High-Definition Multimedia Interface eliminates the need for extra cables while delivering spectacularly clear and vibrant digital video. Connect dual HD sources such as your set-top box and DVD player simultaneously with Sony’s ultimate all-in-one receiver. The STR-DG800 delivers an outstanding audio experience with its powerful 700-watt amplifier. Also has XM radio receiver installed. Don’t let the AVR 140’s modest price fool you. Our most affordable A/V receiver is loaded with features. With on-screen menus that include renameable inputs, component video switching, compatibility with The Bridge™, and our classic high-current, ultrawide-bandwidth amplifier topology, there is no better way to upgrade an old analog system or add high-quality home theater performance when budget considerations are paramount. This player will also up convert standard DVD. The AVR-786S not only delivers great home theater sound, but also offers plenty of convenience features to make your entertainment system easy-to-use and enjoy. The high-current amplification drives up to seven home theater speakers with power and precision. And thanks to a wealth of built-in surround decoding options, you can enjoy high-impact surround sound from virtually all of your movies, music, TV shows, and video games. 2x80W perfect for a main music system, the HK 3380 uses the same discrete high-current, ultrawide-bandwidth-amplifier technology found in our AVR Series receivers. It also has four video inputs (including one on the front panel), a multicomponent system remote control, a 30-preset AM/FM section, a phono preamp, a subwoofer output, a dimmable fluorescent display, pre-out/main-in jacks and even a nine-step, 90-minute sleep timer. Digital Signal Processing (DSP) is at the heart of the Digital Power Slot (DPS) Series subwoofers providing less distortion, customized listening modes and the most output possible. 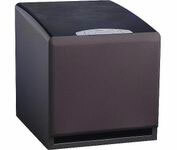 All signal processing of this advanced, yet affordable subwoofer is managed digitally, and is controlled with a single touch of a button using the unique front touch-panel. Located on the panel are four convenient presets for Movies, R&B-Rock, Jazz-Classical and Games, as well as volume control and an exclusive Night Mode setting. 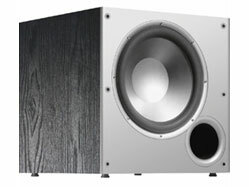 The DPS Series subs easily outperform other subwoofers in their class in both quality and quantity of bass reproduction. Peak power at 375E. The PSW102 offers a clean, stylish look with powerful, accurate and musical bass in a compact enclosure. Built for speed, power and value, the PSW12 is a great introduction to high performance bass for movie and music listening. Peak power at 260W, RMS at 100W. 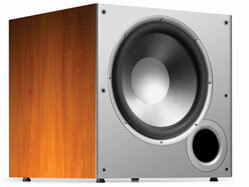 The PSW10 offers a good introduction to high performance sound demands. Excellent price/value ratio. · Non-resonant MDF construction with 3/4" baffle and internal bracing for deep bass impact with superior detail, accuracy and musicality. · State-of-the-art laser-based Klippel measurement technology perfectly centers the subwoofer's voice coil in its magnetic field for improved linearity and deep, precise bass. · Built-in High Current Amplifier supplies all the good, clean power you need for big bass.